PST to NSF Conversion tool convert entire MS Outlook data items like Emails, Calendars, Tasks, Journal, Contacts to Lotus Notes. It exports .pst file to .nsf file format, maintaining relevance and no loss of info after Outlook to Notes conversion. The Software consists of Email, Calendar and Task Filter via which you can export selected data of definite period. By filing date in From and To option of PST to NSF converter it will export the data falling between that date range. You can migrate required folders from PST to NSF by selecting or deselecting the items those are not essential for you to export from Outlook to Notes. It saves the time during conversion. By default Outlook to Notes Converter exports all data items. After exporting all data items from Outlook PST to Lotus Notes NSF you will get the same folder structure in Notes application as of source file. The tool upholds the folder hierarchy during PST to NSF migration which aids to use the data easily in Notes. While exporting data from Outlook PST to NSF, the tool retains the Meta info of emails such as To, Cc, Bcc, received date, etc. and attachments linked to respective Emails after PST to NSF conversion. Also, it upholds the HTML formatting, inline images, etc. after conversion. PST to NSF converter is a Windows based tool which supports MS Outlook 2013 and its entire previous versions together with IBM Notes 9.0 and its prior versions. You can easily execute this tool without any technical support on Windows 8 and all other windows versions. Convert Outlook contacts to Lotus Notes contacts by creating a new names.nsf file. Convert both PST file formats i.e. UNICODE and ANSI to Lotus Notes irrespective of its size. Deprived of the external assistance Software can be executed and implemented effortlessly. Try Outlook to Notes Converter using its Demo version which allows you to convert only 15 mails of PST file to NSF. Is MS Outlook installation necessary to use this Software? Yes, to execute the Software for PST to NSF file conversion installation of MS Outlook is compulsory. 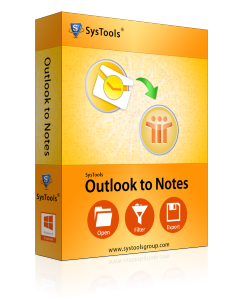 This Software supports Outlook 2013 and all its earlier versions. Can this software convert password protected PST files? Yes, Outlook to Notes Software convert password protected PST files, but you must know the password as the tool prompt to fill the password to export PST file. Which version of IBM Notes should I use to open the NSF file after conversion? You can open resulted NSF file using IBM Notes 9.0 and all its former versions without any difficulty. Is it possible to convert Outlook attachments using this software? Yes, using the tool you can convert Outlook attachments. It exports entire MS Outlook data items maintaining all Email properties after PST to NSF migration. Can I export entire PST data excluding Deleted Items folder with the help of this tool? I am just thanking to all Team members of this tool for designing Outlook to Notes Converter. This tool curbs my all qualms regarding conversion of PST file into NSF. It migrates, my entire data of PST file stabilizing the originality after conversion process.